Today, go a little deeper. It’s easy to recount the big things in life that we’re thankful for: our family, friends, health, homes and employment. There is so much more to be thankful for, however, if you simply look a little deeper. You connect with your own feeling of gratitude every day. Gratitude comes in all shapes, sizes, colors and experiences. It shows itself when you stop to admire that flower by the side of the road. 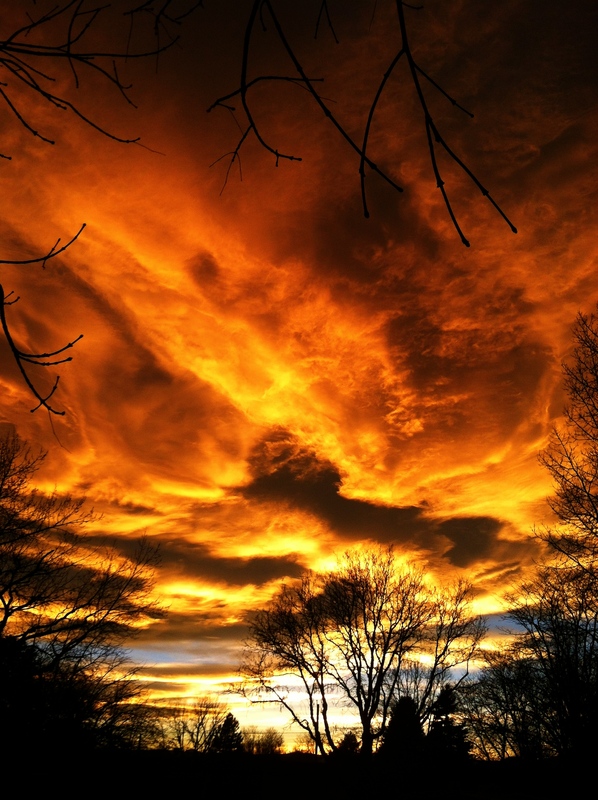 It engulfs you when you pause to look at the dramatic sunset filling the sky. It peeks at you when you lock eyes with the little baby staring at you in the stroller in the grocery store. We often don’t take note of our own connection to gratitude. Instead, we simply brush it off as a passing moment of pleasure or amusement. Standing in a hot shower in the morning, the taste of that caramel latte and the long “welcome home” embrace with your lover. They’re all reflecting gratitude to you. Sometimes we don’t see gratitude at all, like the phone call from a friend who needs your advice right when you sit down to dinner, or the wet nose at your feet when the dog wants to be fed, or the neighbor who wants to talk as you’re leaving for work. We can be thankful for being needed as much as we can thank the people whom we need. Being thankful doesn’t have to stop at the dinner table. It’s a muscle that should be developed and exercised every day. When you stop to notice anything that makes you feel good, makes you smile or makes your heart sing, you’re engaged in gratitude. When you notice it, pause for a moment, then thank yourself and the universe for bringing you such joy. 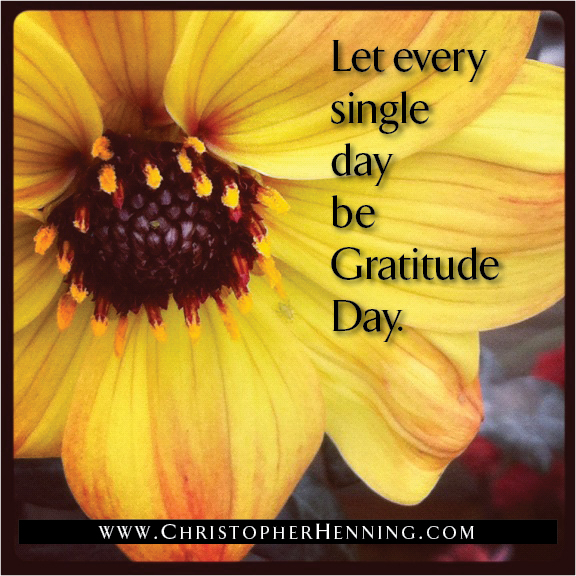 Make every day gratitude day. Are you one of those people who talks to God? I’m not referring to formal prayer but rather to those times when you glance at the sky and pose a question to the universe. We all do. But when you pose a question to God (or the universe, or whatever term you’d like to use), are you really ready to hear the answer? For many people, these questions are simply an expressive form of inner communication. We pose questions out loud in an effort to clarify our own thoughts and sometimes we earnestly ask for direction or help with a challenge. Usually we don’t expect an answer. But what if you get a response? In actuality, the universe is always responding to you, answering your deepest questions, giving you clues on your next direction and guiding you on your personal spiritual path. The universe speaks through many avenues and it’s up to you to listen for the advice you so humbly asked for. This is a brave process. It requires attention and a willingness to act upon the information you receive. Frequently, when we ask a question of God or the universe, we are not ready for the answer. Sometimes we’re scared of the answer because it would mean moving out of our own comfort zones. Other times, we receive answers from the universe but we don’t understand it as such and therefore discount what we’ve just heard or experienced. Learning the language of the universe is extremely important and may feel like a lifelong process. Taking the time to understand and then recognize this language helps you understand that you’re not alone in this world. It helps you feel connected to spirit and helps you make decisions and determine next steps when you need them most. On rare occasions, the universe hands you an answer to your question with such authority, it’s hard not to take notice. That was certainly true for me last week when I received news that a publisher rejected my book proposal. I was, to say the least, disappointed. After spending six months working on the proposal, I was disheartened and started questioning my future. Should I look for an agent to market the book? Should I give up writing altogether? Should I start another project? After earnestly asking for direction from the universe, my first step was to forget the whole matter. Too often we want immediate answers to our questions and then get mad at the universe when it doesn’t materialize an answer in thin air. I posed the question out loud and resolved to let the matter settle a bit while I allowed my emotions to flow about the proposal. Two days later I was talking to my sister about the proposal. I told her my disappointment and outlined my options, including the idea for a new book that was rolling around in my mind. About an hour later, I retrieved the mail. In the stack of bills and circulars was an envelope addressed to my father who’s been deceased for 15 years. It’s not unusual for him to get mail still and I usually just throw it away. But this envelope caught my eye and for some reason I opened it. Inside was the guidance I was looking for. In big bold letters was a book cover with the title, “Write your book…NOW!” The flyer was for a book advising others how to write and publish their own book. Although I wasn’t interested in the book itself, the message was hard to miss. The universe was shouting at me and it was time to get started writing. Deciding on a job or career change can be difficult. For me, I was aware of only my growing dissatisfaction with my first marketing job after college. I had grown significantly in the position, but was starting to get in regular disagreements with coworkers and was becoming intolerant of my new boss. Still, leaving the job didn’t seem like the thing to do. Over the course of the next several months, I began to get colds and strep throat frequently–very frequently. These bouts of illness would require me to stay at home for several days. Once I healed, I would return to work and get frustrated all over again. I asked for help from God. But when no clear answer came, I returned to my familiar, if not uncomfortable, life. I had been expecting some sort of clear revelation from the skies above. I wanted a job to fall into my lap or a winning lottery ticket to take me away from it all. It felt like no body was listening. The universe had been talking to me…in a whisper. Yes, illness can seem more like a shout (especially if you’ve ever experienced strep throat), but since the colds and strep were treatable, I didn’t get the message. On my fifth bout of strep in several months, the universe spoke to me again, this time in the form of a book about the psychological reasons for illness. It had been on my shelf for several months but I never bothered to pick it up. Reading that book helped me understand that I created the illness myself (in cooperation with the universe) and that I’m responsible for my own happiness. Honoring myself was clearly the path I needed to take and God was showing me the way. I decided then and there that I would leave the job within several months. When my friend Liz got engaged, a nagging sense of doubt kept creeping into her consciousness as she began planning the wedding. Although the wedding planning was easy and a lot of things fell into place, she still couldn’t shake the sense that something wasn’t right with the whole engagement. The only glitch was finding a place to hold the event. Things looked up when her future mother-in-law agreed to hold the wedding at her house and even volunteered to paint and wallpaper the living room for the occasion. As the wedding processional started, she descended the stairs into her mother-in-law’s living room, freshly wallpapered with four-inch stop signs in a repeating pattern. She thought it a strange design for wallpaper but brushed off the thought as the wedding began. Needless to say, Liz’s marriage didn’t last long. And after her separation, it became clear to her how the universe was giving her a message, this time through symbols on wallpaper. “It’s so obvious when I think about it now. If only I had stopped to process it at the time,” she told me. On a road trip through Colorado one summer, I became hopelessly lost. I dislike maps and so wasn’t using one to get me from town to town. But as the skies grew dark and with no civilization in sight, all I could see was a vast outstretch of land and a gas tank that was headed toward empty. I tried to quell my sense of panic by reminding myself that everything was OK and that I would find someplace to refuel and stop for the night. But an hour later, there was only darkness ahead. I asked the universe for help. About 20 minutes later, I had the strangest impulse to turn back onto a dirt road I had passed a few miles back. I’m not sure why the impulse was there and tried to talk myself out of honoring it; but before I knew it, I had turned the car around and headed toward that dark dirt road. There were no signs indicating what road it was or where it was headed, but my gut told me to keep driving. After less than two miles of winding dirt road, the darkness ahead of me opened up and I could see city lights. I could clearly make out the signs for a gas station, hotel and McDonalds. I had unknowingly been driving around the back of a small mountain range and had found a small connecting road that led right into town. My impulse—a direct form of communication from my inner self—had guided me right to safety. Had I ignored my impulse and kept driving forward, I may have run out of gas in the middle of nowhere. If you’re lucky enough to recognize and understand when you’re being given advice from the universe, act upon it. If you ignore it, you’re in essence telling the universe, “hey, I asked for your advice but I’m not going to take it now, so don’t bother helping me in the future.” That’s a little over the top, I know, but being grateful for the advice you receive starts by taking action on it. Acting on advice from All That Is helps sharpen your connection to spirit. It helps you develop a sense of trust within yourself and it helps you strengthen your intuitive and psychic muscles—something that will serve you well in every area of your life. Finally, it’s important to understand that when you ask a question of the universe, the universe will respond in kind. If you ask a question without much enthusiasm, the universe will give you little feedback. When your desire to know and to understand is strong, you’ll receive more definitive answers to your questions. Please, be relaxed about this process. Anxious energy thwarts the process and keeps you from hearing the whispers and shouts of the universe. Approach your “question and answer” session with God with a curious, and somewhat playful, attitude. You can be serious in your questioning, but a relaxed approach will help you hear and feel the results you seek. It’s one of those days. You know the kind: when you wake up and from the get-go things just aren’t quite right. You try to brush off the feeling at first, assigning it to the “I woke up on the wrong side of the bed” category. You trudge on through your morning only to be bombarded by unexpected interruptions, negative emails and rude people wherever you turn. We typically turn our heads to the universe in times like this and wonder aloud, “What the hell did I do to deserve this?” We look to reasons outside ourselves to understand why we are having these experiences. In essence, we’ve resigned ourselves to being victims of an uncaring universe. The universe isn’t playing tricks on us. It’s giving us exactly what we’ve asked for, even if we’re not aware of it in the moment. The universe is reacting to our own energy field, utilizing the law of attraction to bring us more of what we’re putting out. And on a bad day, we’re giving out a lot of bad energy. The universe responds to our Vibrational Set Point—the overall frequency of the energy present in our bodies and souls at any given time. That energy fluctuates throughout the day and throughout the week, but in totality, we tend to set a range of vibration that affects most of the things we experience. Our outgoing energy comes in the form of thoughts and emotions. Each thought we have has an electromagnetic quality to it; the same holds true for emotions. And in the most basic of terms, the energy of our thoughts and emotions has a particular “weight” or “density” to it. Certain strong emotions and particular thoughts can have either a light or heavy density. Extreme anger, for example, has heavy density to it. Love, on the other hand, very light. If science isn’t your thing, simply remember this: energy works on the premise of the law of attraction. So energy that you radiate goes out into the universe and seeks out similar types of energy. That energy comes back to you in the form of experience—situations and people that are carrying the same kind of energy. Now, under normal circumstances, our thoughts and emotions tend to self-correct. That is, they ebb and flow through our awareness without much effort—the way it should be. People often get worried about their own negative thoughts or “bad” emotions, such as anger, sadness or jealousy. There is no general need for concern. Allowing emotions some freedom helps them move through the body and the mind quickly and (relatively) easily. So what trips us up? As is the usual case in self-development, the ego can really cause problems. When the ego tries to control thought and emotion, it acts like a damn, catching energy and holding it back until pressure begins to build. As this energy is pooled around us, it gets bigger and denser until we have a hard time clearing it. And when dense energy (read: negative thoughts or unwanted emotions) says with us, we continue to attract bad things into our lives. Don’t blame the ego, per se. It feels as if it’s doing its duty by reminding us of how reality really is. It tries hard, really it does. Unfortunately, the ego’s reality is based solely on what it observes from the immediate environment. Sometimes it asks for help from the intellect, which tries to apply reasoning to explain why the world operates the way it does. This is a false premise and it’s where we get in trouble. Let me give an example to illustrate this better. This morning, I received an email from a co-worker that set me off. Before I could even finish reading it, my blood started to boil and I was thinking of ways to respond, none of which were appropriate. I caught myself at first, trying to put the email out of my mind while I ate breakfast and got ready for the day. It didn’t work. My ego became involved early in this case. I took the information in the email personally; I felt I was being wrongly blamed for a failed work project. Since the ego wants to protect the self (me), it took the information on face value. Certainly, the ego reasoned, the email was aimed specifically at me and I had better start preparing an appropriate response to it. In English terms, the ego said, “How dare she?!? How are we going to fight this?” The ego wouldn’t let my conscious mind look for contrary evidence; it had already made up its mind who was at fault. Despite my best efforts to forget the whole thing, even for a few moments, my mind wandered back to the email repeatedly and I would get angry all over again. Once the ego got involved, it was almost impossible to let go of the thoughts and related emotions. It’s pretty easy to see what’s happening at this point: the ego was damming up negative energy and it was growing bigger and bigger by the minute. As the day progressed, things just got worse. I found myself attracting negativity wherever I went. The line at the coffee shop was out the door; drivers were rude on the street; some jerk almost hit my car when he was parking next to me. The list went on and on. My overall energy had fallen into a dangerous zone and I was attracting more of the same (remember the law of attraction?) wherever I went. We tend to only think about our own Vibrational Set Point when we’re dealing with so-called negative emotions and for good reason. It’s uncomfortable. It brings bad things into our lives. But the same holds true for the opposite. A higher Vibrational Set Point can also bring things into our lives, such as love, abundance, happiness, joy and serenity. On an average day, your Vibrational Set Point will usually be set to a range that works best for you. Are you generally a happy person? Are you frequently sad? Are you prone to anger or jealousy? Or my personal favorite: are you always sarcastic? We each have tendencies that feed overall into our energy field. As we have experiences such as my bad day above, we move the needle of our Vibrational Set Point, inching it closer to negativity or positivity. Your Vibrational Set Point sets the stage for future experiences. It’s important to remember that so that you can learn to attract what you want instead of what you don’t. So if the goal is to have a Vibrational Set Point that’s at the higher end of the scale, i.e. in the range of positivity and love, how do we get there? It starts with becoming aware of your thoughts, emotions and energy at multiple points throughout the day. And when you find yourself moving down the scale, it’s time for action. As I said earlier, thoughts and emotions naturally move through the mind and body. Left alone, a good percentage of your thoughts and intense emotions will probably pass in a moment’s time. It’s when those thoughts and emotions get stuck that you’ll want to take notice. If you find yourself ego-obsessed with a negative thought or emotion, rouse your consciousness to do something about it. This takes work and practice. It takes a commitment to self-development. I won’t lie to you: it can be hard. I spent the better part of the day purposely trying to change my Vibrational Set Point. After many attempts, I was finally able to pull my ego out and allow my vibration to rise. On the other hand, if you find yourself dwelling on happy feelings and reliving say a wonderful call from a friend, stay with it. Look for other things that match the vibration, like petting your dog or taking a moment to appreciate the sunset. Enjoy the feeling; revel in it. Ride it like a wave. Becoming aware of ego-bound thoughts and emotions is the first step in changing them. Sometimes, it may seem impossible to move higher up the scale when you’re faced with a difficult thought or emotion. Realize this is where you’re stuck and remind yourself that staying stuck will only bring you more of the same. This is the all-important “choice point.” You can stay stuck or you can move out of it. Be brave and set your intention to re-set your system. Try this exercise for two days. This way you can begin to see what kind of energy you are attracting to yourself. Of course, if you’re having a day like I did today, it will be pretty easy to see how a change in vibration can add up to a whole different day. If you find yourself becoming ego-bound in negative thought or emotion, stop and see if you can change course. Distract yourself, pamper yourself, do whatever it takes. If nothing else, realize you have a choice in how you feel and respond and then let it go. With awareness and practice, you can learn to change your Vibrational Set Point. Learning to adjust your vibrational thermostat to a higher frequency will not only change your attitude but your future as well.